Endless praise has been heaped on Glock pistols and with good reason. First off, they are incredibly reliable and have been adopted by numerous law enforcement and military organizations around the world. They are reasonably priced, easy to maintain and, not finicky about what ammo you feed them. There are so popular that there is an entire industry built around Glock aftermarket parts. They are also accurate. I had never been a Glock enthusiast but my interest was piqued around the new G40 Gen 4 MOS for a couple of reasons. First off, the new MOS (Modular Optic System) platform, which allows you to easily mount a red dot optic on the slide, is a great asset. It features four styles of base plates that will accommodate popular red dots from manufacturers such as EOTech, Docter, Insight, Meopta, Trijicon, C-More, and Leupold. I was particularly drawn to the (10mm) G40 for another reason–its ballistics. The 10mm Auto round has similar, flat shooting characteristics as the.41 Magnum and the .357 magnum. These rounds allow you to hit targets extremely accurately at 100+ yards. ZEV provides it’s own striker with two options (2 lb and 3 lb) springs that will replace the stock part. How accurate? A .41 or .357 (with at least a 6” barrel) can consistently hit an 8” metal gong at 100 yards. This is not easy with iron sights but it’s certainly more do-able with a red dot optic. Theoretically, you should be able to do the same thing with the optic-mounted, 10mm G40. At least, that was the genesis for this story. The G40 model also appealed to me because it has a 6” barrel which is certainly long enough to provide the velocity you need to whack a small object at a long distance. Priced at a street price of around $700, the G40 is not “cheap” but it’s less expensive than just about any 6”, 10 mm handgun out there. So how in fact could you accurize a stock G40 without having to go to a gunsmith? After consulting with my Glock guru, Brian Takaba of X-Ring Security in Honolulu, I elected to make a couple of straight forward modifications. I replaced the stock barrel with one from Lone Wolf Distributors and the fire control group with a ZEV Technologies Fulcrum Trigger. For better handling, I added Talon Gun Grips which I was recently introduced to at the SHOT Show. As has been said since time memorial, the trigger is perhaps the most crucial component in the search for accuracy. Stock Glock triggers always make the gun go “bang” but are not the first choice for long range accuracy. First and foremost, they are a striker-fired design. Striker fired pistols have some tactical and design advantages over the older hammer fired system. There have less moving parts and no external hammer, allowing for a more snag-free layout when it comes to concealed carry. This design also guarantees consistent trigger pull. That means every shot, from the first through the final round of the magazine, will have the same pull weight. The main drawback with the striker design, and the stock Glock in particular vs. a hammer fired gun is that it has a long, mushy pull. It’s much harder (at least for me) to predict the break. This makes it inherently more difficult to master for pinpoint accuracy. 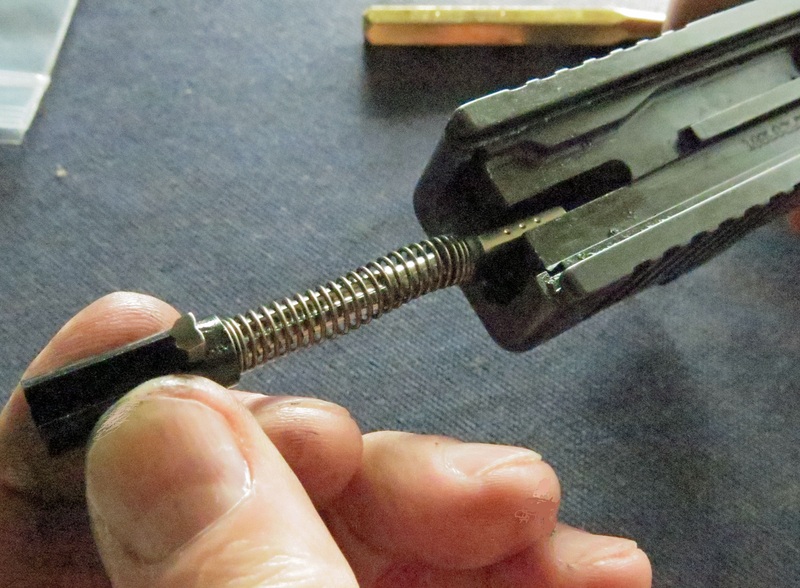 The ZEV parts kit comes with a firing pin safety and spring replacement. Try firing any decent 1911 or a stock Smith & Wesson or Colt revolver. The crisp trigger break afforded in single action allows a marksman to place a shot just about anywhere under 50 yards. You simply can’t do that with a striker fired gun. (At least I can’t). In fact, there’s a whole cottage industry devoted to third party Glock triggers designed to supersede the stock versions. Are they as good as a tricked out 1911? No, they don’t approach that level but they are an order of magnitude better than a box stock Glock. For this reason I acquired a Fulcrum Ultimate Kit from ZEV. (See photo at the top of this page). Recognized for its quality aftermarket Glock parts, ZEV Technologies was founded in 2008 by Alec Wolf. They manufacture a wide variety of items with the exception of recoil springs, Night sights and the frame. A custom gun built by ZEV was used by Team Glock’s KC Eusebio to win high overall at the Steel World Speed Shooting Championship in 2012. Manufactured with 6061 aircraft grade T6 aluminum the ZEV kit has a number of improvements over the stock fire control group. One of the biggest enhancements is its wide range of adjustable trigger features. You can fine-tune the pull weight to as low as 3 lbs as well as tweak the pre-travel and over-travel. There are other design elements. The trigger face is flatter and the trigger safety is three times wider than a stock trigger. ZEV says this is helps place your finger in the optimal firing position and build muscle memory to promote consistency and accuracy. The Kit also has a polished, “skeletonized” firing pin, which is lighter than the stock version and has an extended tip for more for a more positive primer ignition. There is a disclaimer on the instructions that the trigger should be installed by a Glock Armorer but I suspect this is more for insurance purposes. There is a well-written, well-illustrated installation manual that even a non Glock Armorer (like me) can follow. ZEV also has some excellent installation videos. To install the trigger all you need is a 3/32nd punch. (The trigger kit comes also with a couple of minuscule Allen head wrenches to regulate trigger pre-travel and over-travel but that is an elective option). Essentially you field strip the gun, remove the locking block pin, the trigger pin and the ejector housing pin with the punch, pushing out the pins from left to right. 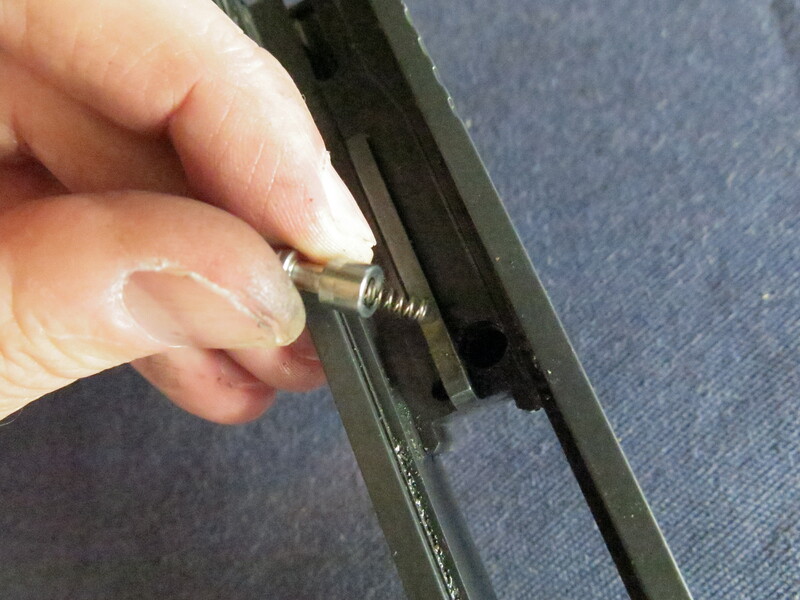 You then remove the slide release lever, the locking block and pop out the trigger assembly. After slipping in the trigger assembly you put things back together in the reverse order and you’re more than half the way there. The next steps are to add the striker (which has two or three-pound spring options) and the firing pin safety with its own spring to the slide. ZEV recommends you try the preset configuration on the trigger before messing with the pre-travel and over-travel adjustments. The Fulcrum Trigger does live up to its reputation. It’s more precise than the stock FCG and has a much crisper, cleaner break. The pre-travel is still longer than I’d like but of course, it’s adjustable. The ZEV product is not going to be confused with a 1911 trigger but it’s light years better than the stock Glock. In my experience, the company also has an excellent technical support team. I called them up to ask a few questions and after a minimal wait time, my queries were quickly fielded. The Lone Wolf 10mm barrel in all its greasy glory. LWD barrel has tighter tolerances and offers you the option to shoot cast bullets. It’s priced at around $100. There are a host of third party barrels out there. There’s certainly nothing wrong with the stock Glock barrel. In fact it’s quite good. However, one can expand one’s ammo choices with an aftermarket product and theoretically improve accuracy. The hexagonal rifling found on a stock Glock barrel is not designed for cast lead bullets, which are the choice for many target aficionados, especially those who shoot silhouette competition. Glock’s hexagonal rifling causes a lead build up which is less than optimal. The rifling on barrels from Stormlake, KKM, Lone Wolf, and other manufacturers allow you to shoot cast bullets. By definition, aftermarket barrels offer higher tolerances and more accuracy. At least that’s the theory. Another advantage is that aftermarket Glock barrels, which sport fully supported chambers, are less apt to mutilate the brass. For reloaders, this is no small issue. Less adulterated brass means a case will live another day as a reload. Installing a barrel is an easy upgrade for even the beginner to accomplish. You simply field strip the gun and swap out the old with the new. If you can clean your Glock you can install a barrel. The next most important component for accuracy is the barrel. 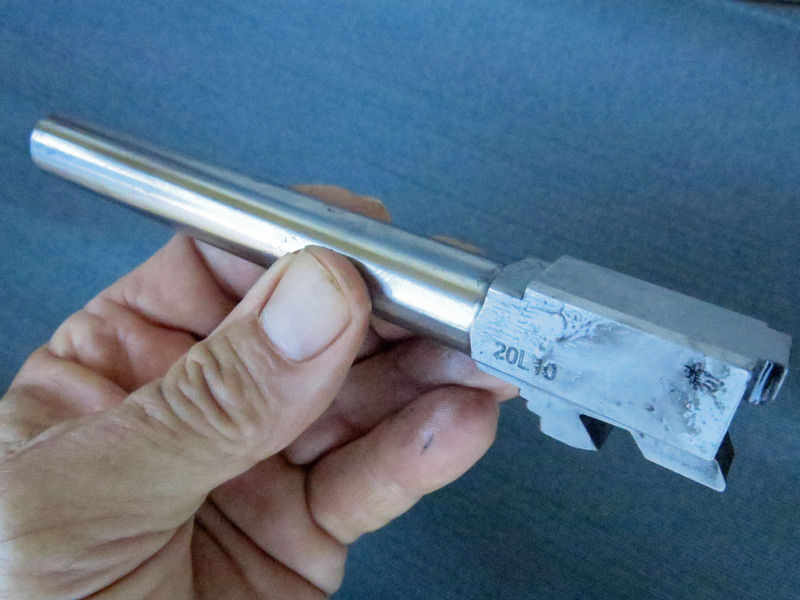 Prices for 10mm Glock aftermarket barrels range between $150 – $300. I decided to go the Lone Wolf option. (LWD) is well known to Glock enthusiasts for high quality upgrades and custom components. Founded in 1998 by JR Shepard, the company caters to the “every man” looking to trick out their Glock. Their barrels are standard cut rifling, allowing one to shoot cast-bullet reloads safely, without gumming up the works. They produce nearly 200 different barrels for the Glock lineup including different styles such as ported, threaded, conversion, long, etc that Glock doesn’t even offer in their OEM lineup. The Talon Grips made an inexpensive but vital improvement to getting a purchase on the gun. The 10mm barrel, according to LWD’s Marketing Manager Zack Carlson, hesitated to call any of their offerings “match” grade but said their 10mm designs have a tighter chamber and more case support than the stock versions. Lone Wolf barrels are the least expensive of the third party offerings and are manufactured by Dasan Machineries Company, a Korean concern. I took my accurized G40 to the Kokohead rifle range here in Hawaii where we’re allowed to shoot our (optic mounted) handguns at slightly more than 100 yards. I mounted a paper target at 50 yards and a 14” gong from CMP at about 105 yards. I got a very respectable grouping at 50 (meaning I could keep my most of my bullets in the black) and then concentrated my efforts at hitting the gong. I was very pleased with the ZEV trigger system, which was a qualitative improvement over the stock trigger. Based on my experience with the stock trigger, it would have been difficult to get the grouping at 50 yards that is posted in the photo below. (Street price for the Fulcrum Trigger kit is around $255). However, consistently hitting the 14” gong proved to be a helluva lot more difficult than I had originally expected. In other words I came out of this review, quite humbled. I tried a several different handloads that didn’t help my cause. The best results came from factory ammo from Sig Sauer Elite Performance 180 gr FMJ ammo. At 50 yards, offhand, I won’t win any awards at Camp Perry but this is very respectable for a striker fired gun. At our range we’re allowed no more than 5 rounds per magazine and I averaged about two shots out of five or a 40% hit rate. My best was 3 out of five. Could I improve on this with practice? No question. 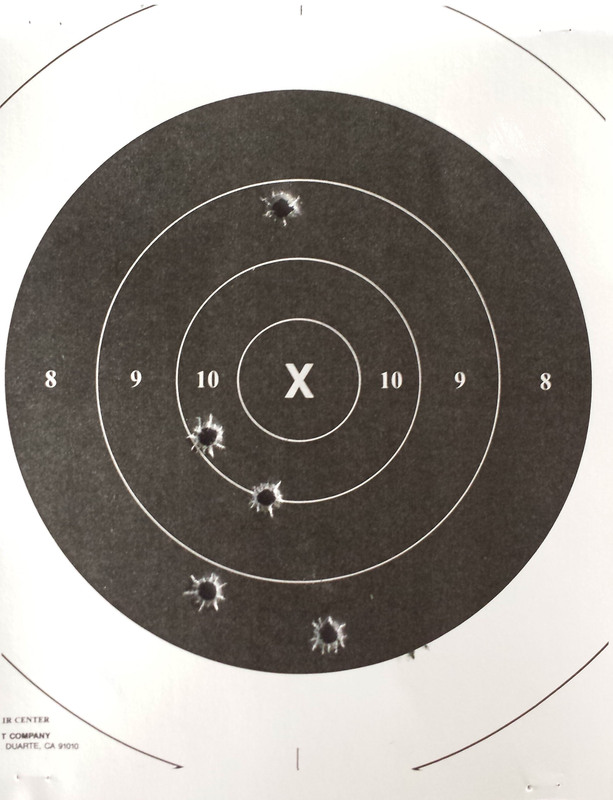 However, shooting a 14” gong with a target revolver at 100 yards with a target revolver is no great shakes. In fact, with the right revolver (in my case a Freedom Arms Model 83 with a 7.5″ barrel) you can hit an 8” gong at 100 yards with regularity. I think it’s asking too much to turn a Glock, even with a great aftermarket trigger, barrel and grips into a competitive (100+ yard), silhouette shooting, tack driver. That said, I think it’s fair to say for an extra $380 (including the grips) I coaxed a great deal more accuracy out of the G40 than a box stock model. I also believe with the proper hand load, I could tighten up the groups even more. Camp Perry Competitors can relax. Feral hogs and bad guys, take note.